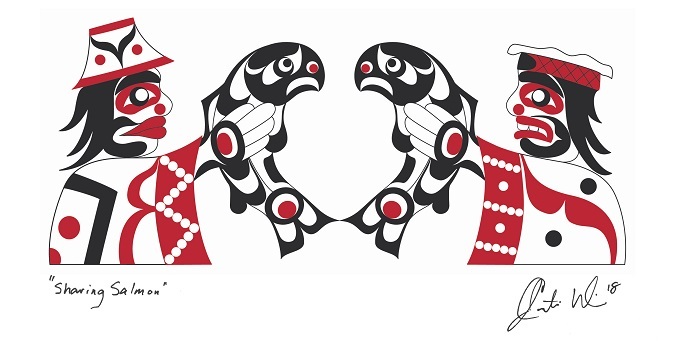 Our “Sharing Salmon” logo by artist Mulidzas-Curtis Wilson of the Wei Wai Kum First Nation depicts a man and a woman exchanging a male and a female salmon. It demonstrates that by holding up our questions and concerns for all to see, we can honor and respect the spirit of our life-giving salmon. We appreciate salmon in multifarious ways. Some choose to go to the hatcheries and farms where the salmon are being raised. Others go out and search for them in rivers and streams, and on the Pacific. On this coast, we are a culture of fish, committed to stewardship and good practice. We are not divided on the need to respect salmon and other people whose perspectives on salmon are unique to them and worthy of acknowledgment. Sharing Salmon is a unique collaboration to advance constructive dialogue around salmon. Our geographic focus is the coast of British Columbia. Those endorsing this project are engaged citizens who recognize that the salmon aquaculture industry faces some big challenges, as well as many opportunities for aiding the cause of wild salmon. By listening carefully to residents of Vancouver Island communities, we discovered that the salmon farming issue goes way beyond science. It’s a social issue and maybe that’s because, decades ago, salmon farming did not get started on the right foot. So much is at stake. Communities all over the coast depend on a successful balance between wild and farmed salmon. Can we get back on a solid footing? Ultimately, that’s up to you. Sharing Salmon is the result of the Community Conversations process. We were inspired in part by the teachings of First Nations philosophies of conservation, for example the Huu-ay-aht people’s sacred principle of ?iisaak that seeks personal and collective respect for the community and its people, traditional knowledge, the natural world, the metaphysical world and other peoples and communities. Thank you for getting this far. Here’s our biggest discovery. What everyone has in common in British Columbia is their love and passion for wild salmon. We’ve had support and an open reception – from the BC Salmon Farmers, from scientists and academics, from First Nations, and from local community members who are living their passion for wild salmon and raising safe, healthy food for the world. We must thank the town councils that received our report when we provided our initial findings in the spring of 2018. The spirit of openness and curiosity with which we were greeted was evidence that there is still room for conciliation and compromise. We are calling for enhanced commitment to public awareness. At the Community Conversations events, it quickly became apparent that a lack of education and poor public perceptions are hurting salmon farming. Let’s not blame the public for that. The onus is on salmon farming people to succeed in sharing their information. We heard that environmental protection is an absolute must if we are to continue seeing the production of sustainable, world-quality products that bring all kinds of benefits to coastal (not just coastal!) communities. We heard it’s time to focus on the storytelling and people of salmon farming – speaking to what salmon farming does in our communities to create opportunity for families and children. And suddenly we discovered that the coast of British Columbia is loaded with great stories – like our new video Quatsino’s Babies, telling the amazing story of how salmon farming has rallied around the raising of Chinook salmon for release into the wild. We also heard that responsible natural resource management is synergistic with environmental management and community health – just by virtue of business. That is a good news story and well aligned with the values of the future. Ecological sustainability and ocean stewardship. Of all the values that were discussed at our diverse meetings, those surrounding sustainability were the likeliest to be held in common. Could there be a more perfect starting point for these challenging times? And it starts in our local rivers and inlets where opportunities to nurture wild fish alongside the salmon farms is the source of our greatest joy. It’s time for a new era – the era of Sharing Salmon!